Percy is having to train up a new cushion to his liking. Arthur deliberately sat on his favourite red cushion and now it will never be the same. This new one has a rather attractive tapestry of chickens on it, and it will have to do now that the red cushion is broken. Percy is familiar with chickens, there are several who live out in the garden; chickens do not give Percy any trouble at all, only Arthur does. 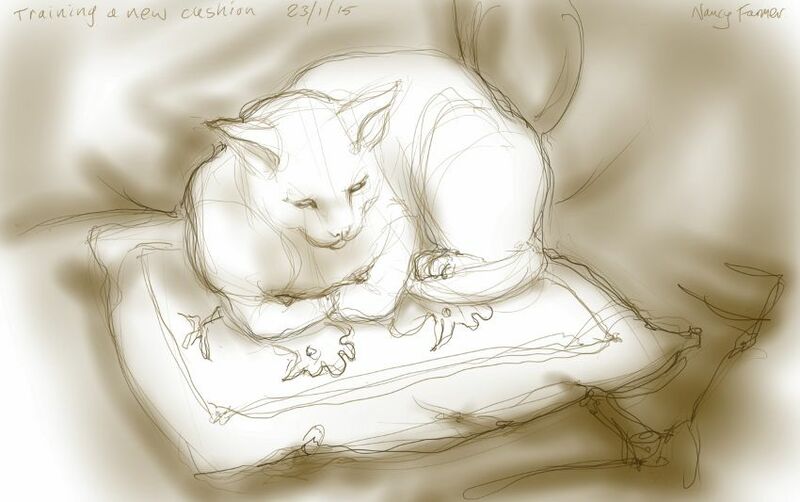 This entry was posted in Cats and tagged art, cat, cat drawing, cat sleeping, cat sulking, cat-of-the-day, digital sketch, drawing, Percy Cat on January 23, 2015 by Nancy Farmer. Poor Percy. I feel his pain. Thank you Carol, Percy gratefully accepts all offers of sympathy.